All the best essential items you need to start your new chicks. This upgraded kit has everything you need but feed and bedding. The brooder is capable of handling 25 chicks for 2 weeks. This set-up is great for reusing over and over again. Brooder panels fold flat for easy storage till next year. Great of hatching your own chicks or enjoying ours. Includes all of the following. Is the bulb in the premium starter kit white or red? 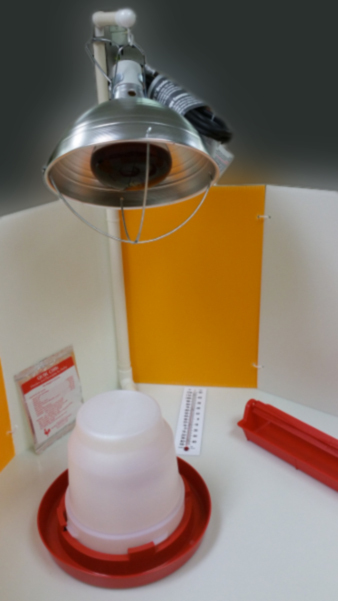 The premium starter kit includes a 250watt Infa-red heat bulb. What should I use for bedding in the premium starter kit? Chicken newbieJust received my premium starter kit. McMurray website says kit will support 25 chicks for 2 wks. When it was delivered, I noticed the box says, "Will support 15 chicks." I suppose I may need to find a bigger container since I have 26 chicks on the way.